Hairstreaks, the subfamily (Theclinae) of butterflies in the Lycaenidae family, are generally, but not always identified by the small protruding hair at the bottom of the tail. 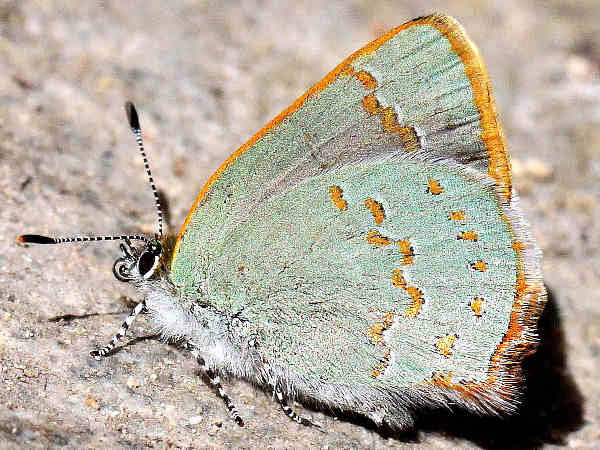 Most of the one hundred or so hairstreak species live in a geographically limited range. 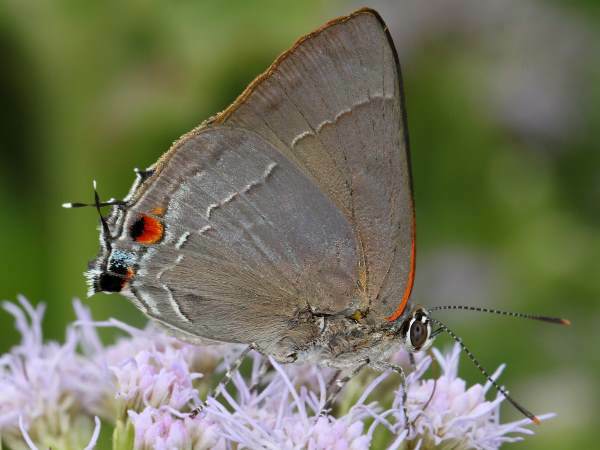 The Gray Hairstreak is an exception to that rule, with a range extending throughout most of the United States. Hairstreaks divide into around a dozen different genera, with approximately two-thirds of the species belonging to one of three genera: Callophyrs; Satyrium; Strymon. Hairstreak butterflies identification starts out straight forward, with the patterns on the underside of the wings serving as the basic identification clues. Most species are relatively small, the size of a penny or nickle when the wings are folded, so getting a large, accurate picture might be the most difficult identification task. The Silver-banded Hairstreak (Chlorostrymon simaethis), top picture, a tropical species, inhabits small areas of south Texas, south Florida and southern Arizona. 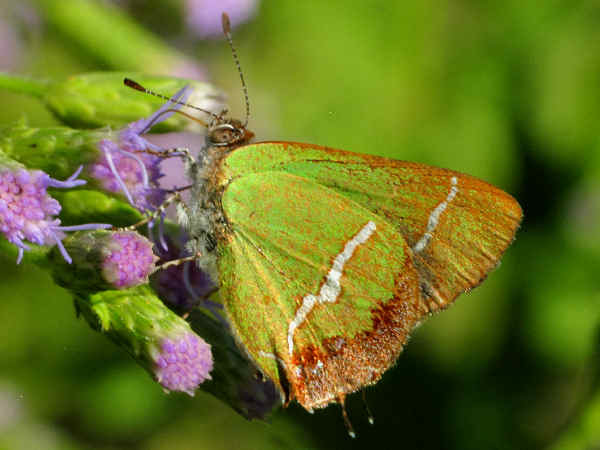 Green wings bring color to the hairstreak scene along with making it fairly easy to identify. 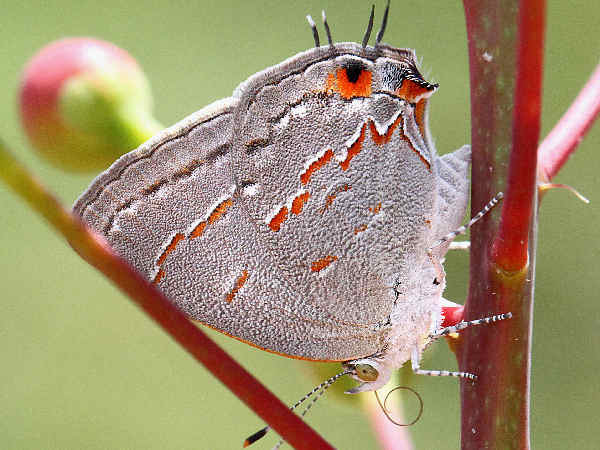 Hairstreaks in the Callophrys genus figuratively translates into color. Taxonomic debate exists regarding genus organization, traditionally the North American species divide between the elfins and greens. Close to twenty documented species inhabit all areas of North America. 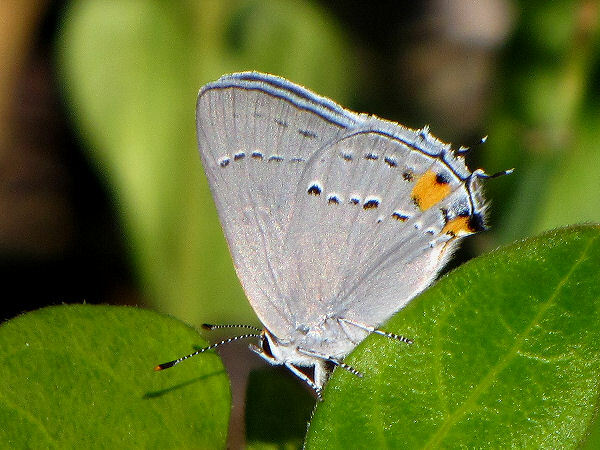 Elfin butterflies are a group of hairstreaks in the Callophrys genus often adopt a common name based on their habitat, such as the Desert Elfin and the Bog Elfin. 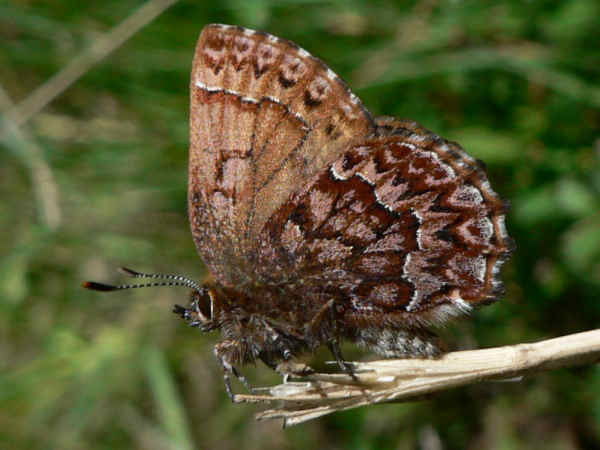 One of the less colorful elfin species, the Brown Elfin (Callophrys augustinus), takes its common name from the relatively plain brown wings. 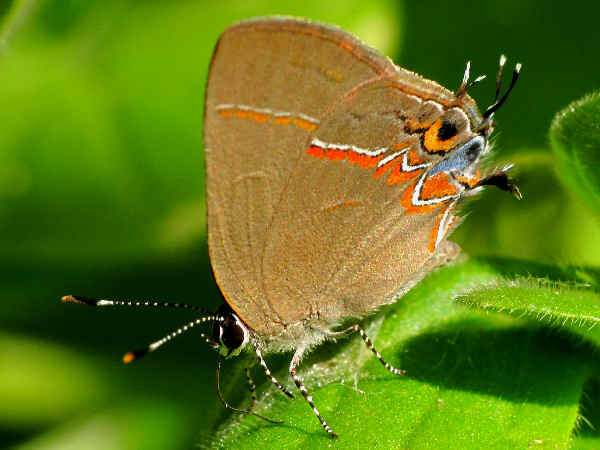 Small populations of Brown Elfins thrive in most forest areas of North America, principally because their larvae have adapted to feeding on a variety of native plants, including blueberries. It stands to reason that the larvae of the flashier looking, Western Pine Elfin (Callophrys eryphon), pictured here, feed on pine tree needles. They, along with the Eastern Pine Elfin (Callophrys niphon) make their seasonal appearance during spring in pine forests throughout North America. Callophrys also literally translates into green butterflies. Please press the button to see many more of the Callophrys species. Many, but not all Satyrium caterpillars feed on oak leaves, the Behr’s hairstreak pictured, represents an exception to the rule. They are western butterflies with a range extending from east of the Cascade and Sierra Nevada mountains to the eastern slopes of the Rocky Mountains. 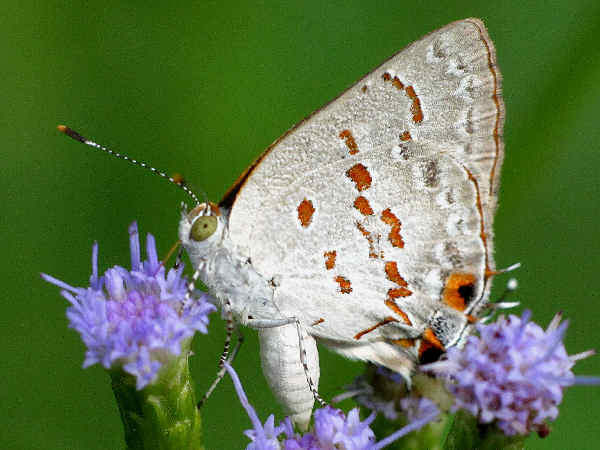 For practical purposes, the Gray Hairstreak (Strymon melinu) represents the Strymon genus of haristreaks in the United States. 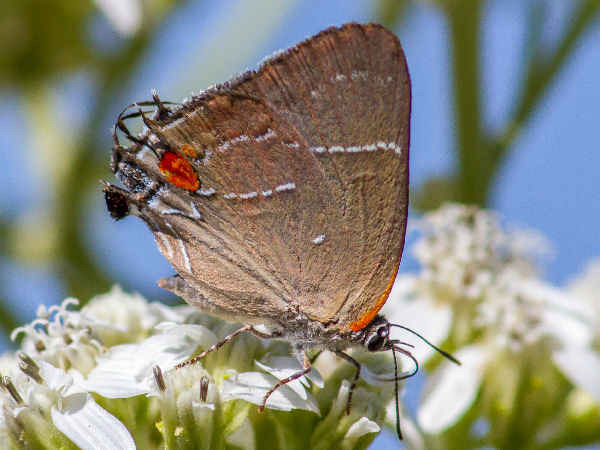 With the exception of portions of the northern Midwest and New England, the Gray Hairstreak inhabits most areas of North America. Its extended range can be attributed to its adaptability. A variety of flowering plants, including members of the pea and mallow family serve as larval host plants. Adults also nectar on a variety of flowers. The top picture shows its characteristic gray wings with orange spots on the border next to the protruding tail hairs. They blue/gray wings means it could easily be mistaken as a blue butterfly. The presence of a tail is the first field identification clue. It is a bit larger in size compared to other hairstreak species. Please press the button for more great Strymon hairstreak butterfly pictures and identification tips. Four additional genera of hairstreak butterflies have the Latin name strymon, with an adjective preceding it. The first four pictures in this section cover them. While butterfly taxa continues to change as DNA research continues, the easiest way to describe these similar genera is to say they are all basically subtropical species with a physical similarity. 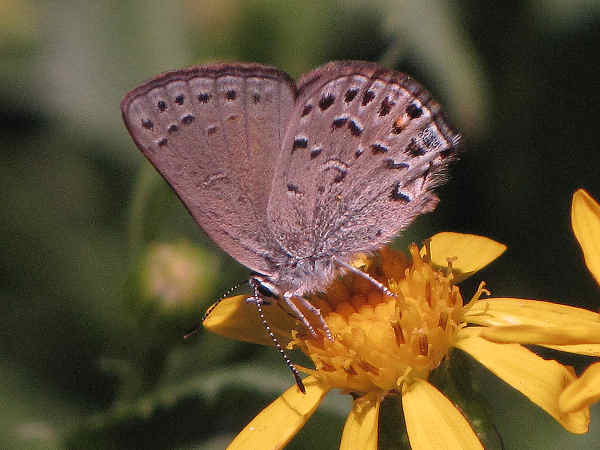 For example, the Clytie Ministreak (Ministrymon clytie), one of three native North American Ministrymon, inhabit areas of the Lower Rio Grande Valley of Texas and Southern Arizona. The name Ministrymon makes sense as it physically resembles a smaller version of a butterfly in the Strymon genera. The genus is named after the Greek river Strymon. It refers to the river-like ‘hairstreak’ line on the underside of many Eumaeini genera including Strymon, Hypostrymon, Nesiostrymon, Ministrymon, Chlorostrymon and Electrostrymon. In many species this streak is indistinct or is broken up into a series of spots. The double tail and orange striped pattern on the underside of the wings are good field identification clues. Leda Ministreaks (Ministrymon) are the second of the genera and they are the Southwest species. 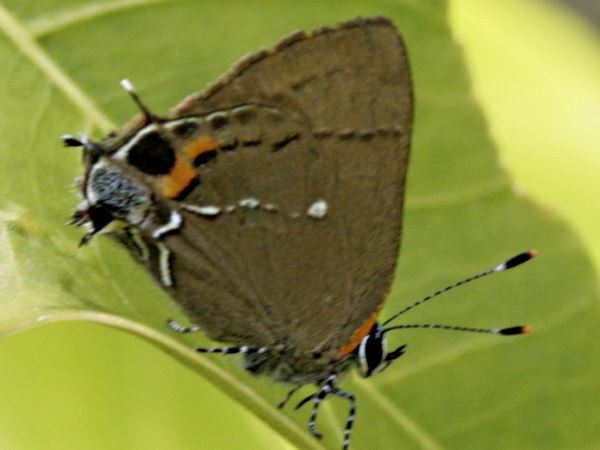 Fulviou Hairstreaks (Electrostrymon) are a Florida species. Soapberry Hairstreak (Phaeostrymon alcestis) are also a one of a genus species related to the Strymon and they are a Southwest species. 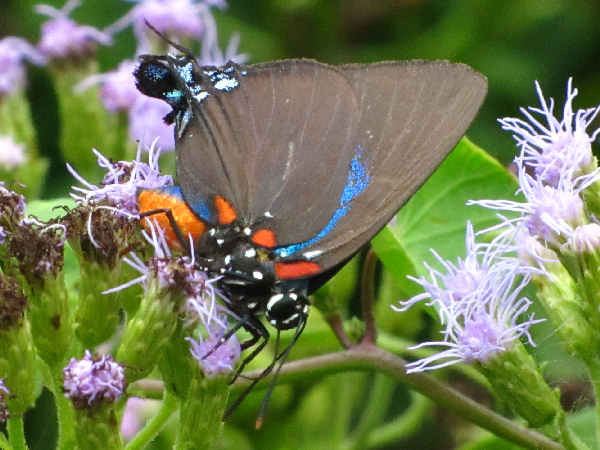 Great Purple Hairstreaks (Atides halesus) also contribute to the colorful hairstreak world. Larvae feed on mistletoe and adults prefer wooded habitat. They can be found in many southern areas of the United States that provide suitable habitat. 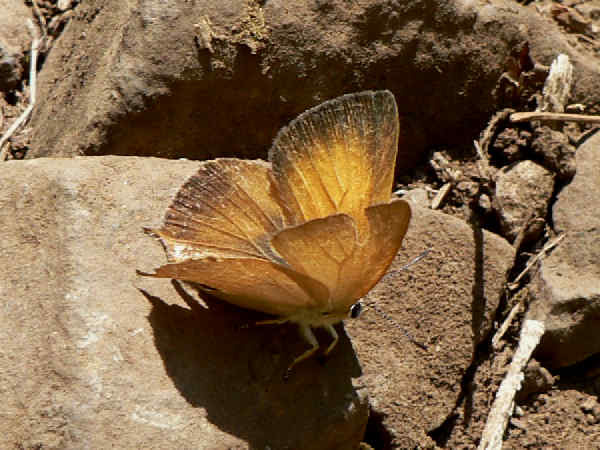 Golden Hairstreaks are the sole member of the Habrodais genus. They are a West Coast species. 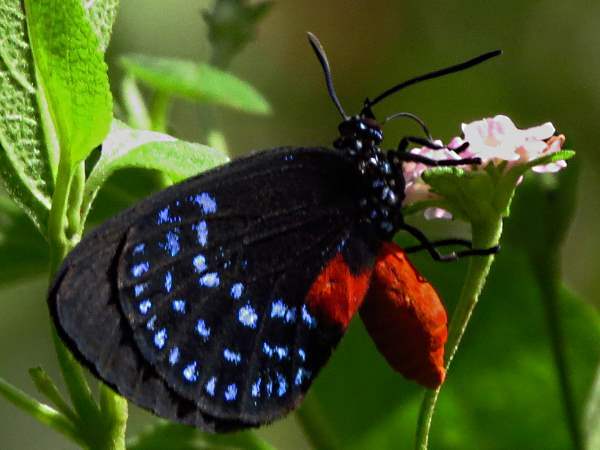 Atala (Eumaeus atala) also bring the color to Hairstreaks. They are a Florida specialty and the only species in the genera in the United States. Beachgoers can look for them along the Southeast cost. 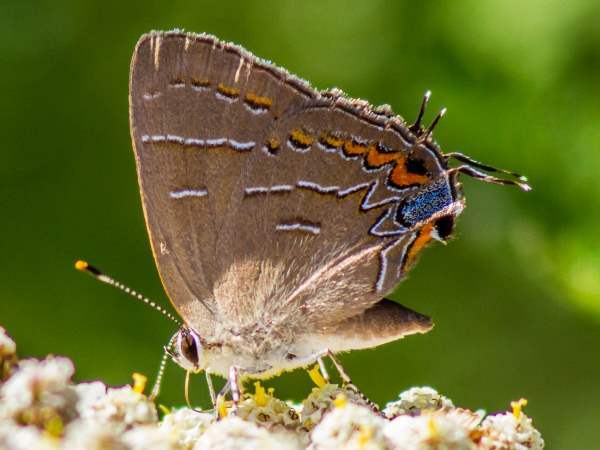 The Dusky-blue Groundstreak (Calycopis isobeon), one of two native calycopis species, inhabits forest areas in the subtropical Americas from Venezuela in the South, to South Texas in the north. Occasionally southern Arizona hosts a few visitors. The picture highlights the insect’s dark orange markings, especially on the hindwing. The sky blue spot on the hindwing, directly under the second pair of tails adds another bit of flash. Caterpillars feed on various forest floor leaves and adults nectar on flowers. They fly almost year round. Red-banded Hairstreaks are the other Calycopis species. They too are a sub-tropical specialty. White-M Hairstreak (Parrhasius m album) are fairly common in the Eastern United States. They are the sole representative of the genus. Arizona Hairstreak (Erora quaderna) in the picture and the Early Hairstreak (Erora laeta) of the North are two great looking butterflies. The tops of the wings have a blue sheen. The side of the wings is a great looking green color. 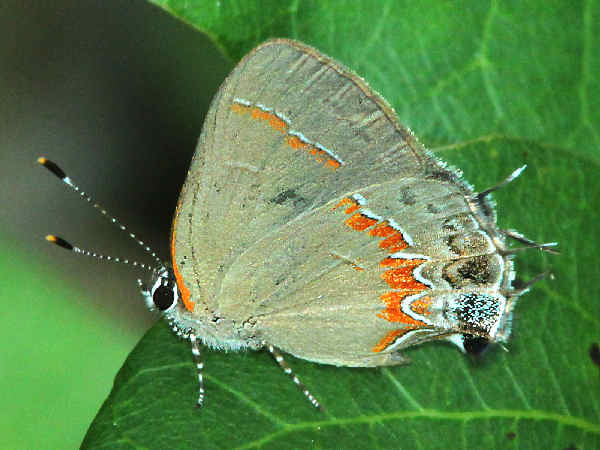 Marius Hairstreak (Rekoa marius) one of two native rekoa species is a visitor to South Texas.